The Los Angeles City Council voted on Tuesday to ban electronic cigarettes, or "vaping," from most public areas, in line with the restrictions already in place on other tobacco products. Lawmakers voted 14 to 0 to restrict the use of the e-cigarettes in restaurants, work areas, clubs, bars and many shared areas like parks or beaches. Last week a committee had approved a proposal for the ban, which put it up to a vote. Vaping lounges and e-cigarette stores will not be included in the new legislation, but the sale and use of the devices at those places will be restricted to those 18 and older. People who are using e-cigarettes for filming or theatrical purposes will still be allowed to do so. "What we're doing is taking a very sensible, fair approach to regulation that controls the second-hand aerosol exposure to thousands of employees in the work force, young people," Los Angeles City Councilman Mitch O'Farrell said to CBS Los Angeles. Not everyone agreed that the ban should include so many places. Jeff Stier, a senior fellow at the National Center for Public Policy Research, told the Los Angeles Daily News that people who use e-cigarettes should be allowed to smoke in bars. "The city should take precautions that these regulations are narrowly applied for a public-health goal that may do more harm than good," he explained. "Now, when people go to a bar, they have to go outside to smoke. 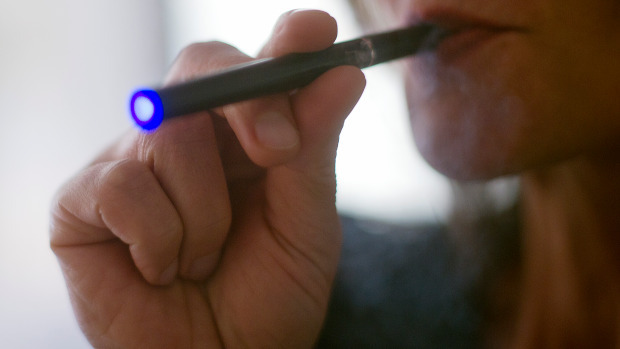 If you ban e-cigarettes, those people will have to go outside with the smokers." "Many of the people using e-cigarettes are former smokers -- and what will happen is they are going to go back to smoking tobacco products. This just doesn't make sense," he added. NJOY, the world's largest independent maker of e-cigarettes, said in a statement to Reuters that they were glad the ban still allowed for e-cigarette use in some places. Still, they thought it went too far. "Although we believe the final decision was made in the absence of credible science, it was a more reasonable and sensible approach than the original proposal," the company said. "NJOY remains concerned, however, that banning e-cigarette use in public places could deter current tobacco smokers from using the products and thus disserves public health." E-cigarettes allow liquid nicotine to be converted into an inhalable vapor without the use of combustion. There is no tobacco either, which means there's no smell. The battery-powered devices look like pens or cigarettes. Sales were estimated to reach over $1 billion in 2013. Proponents of the product say that there is no proof the vapor from e-cigarettes can harm people like second-hand smoke, and could help former smokers quit smoking tobacco products. But, the fact that they are not regulated by the Food and Drug Administration does not ensure that all the contents of the devices are safe. "It's liquid that has nicotine, some flavoring and some other chemicals, and it's heated up with a battery into a vapor, and you get the rush of the nicotine; the problem is it's not FDA approved or regulated," Dr. Jon LaPook said on CBS This Morning. "We really don't know everything that's in it. We don't know enough research in terms of the long-term risks." The FDA has expressed concerns that younger people may be attracted to e-cigarettes, and not enough research has been done on the chemical components of these products. The Centers for Disease Control and Prevention said that between 2011 and 2012, e-cigarette use more than doubled among high school students from 4.7 percent to 10 percent. The CDC is concerned because 90 percent of all smokers start as teens. "When you're 15, you want to be cool," Council President Herb Wesson told the Los Angeles Times. "And I will not support anything -- anything -- that might attract one new smoker." Chicago's City Council banned the use of e-cigarettes in offices, indoor public areas and within a certain distance of building entrances in January 2014. New York City lawmakers approved a measure last December to include e-cigarettes in the city's public smoking ban.